There’s an open secret in America: If you want to kill someone, do it with a car. As long as you’re sober, chances are you’ll never be charged with any crime, much less manslaughter. Over the past hundred years, as automobiles have been woven into the fabric of our daily lives, our legal system has undermined public safety, and we’ve been collectively trained to think of these deaths as unavoidable “accidents” or acts of God. Today, despite the efforts of major public-health agencies and grassroots safety campaigns, few are aware that car crashes are the number one cause of death for Americans under 35. But it wasn’t always this way. Though various automobiles powered by steam, gas, and electricity were produced in the late 19th century, only a handful of these cars actually made it onto the roads due to high costs and unreliable technologies. That changed in 1908, when Ford’s famous Model T standardized manufacturing methods and allowed for true mass production, making the car affordable to those without extreme wealth. By 1915, the number of registered motor vehicles was in the millions. 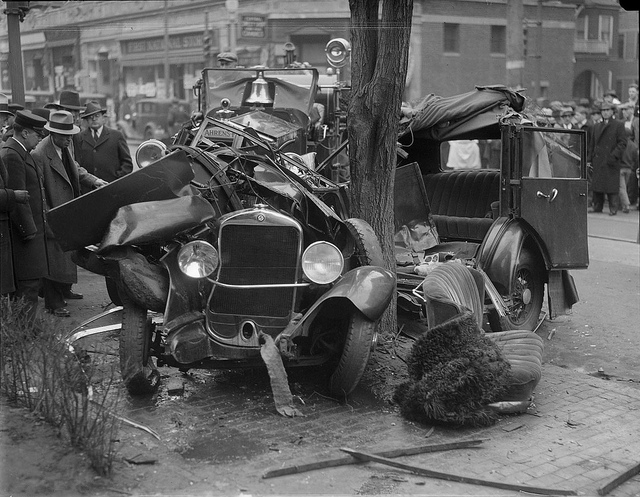 Top: A photo of a fatal car wreck in Somerville, Massachusetts, in 1933. Via the Boston Public Library. Above: The New York Times coverage of car violence from November 23, 1924. Within a decade, the number of car collisions and fatalities skyrocketed. In the first four years after World War I, more Americans died in auto accidents than had been killed during battle in Europe, but our legal system wasn’t catching on. The negative effects of this unprecedented shift in transportation were especially felt in urban areas, where road space was limited and pedestrian habits were powerfully ingrained. 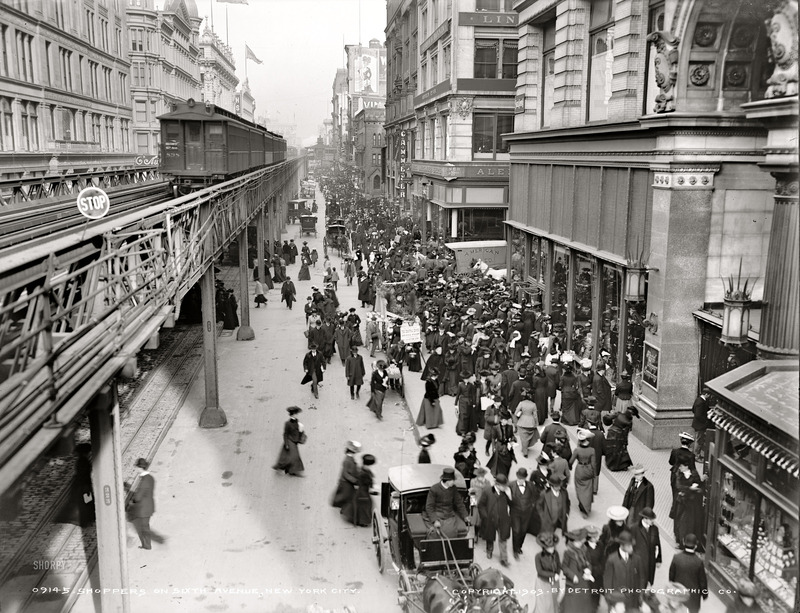 A typical busy street scene on Sixth Avenue in New York City shows how pedestrians ruled the roadways before automobiles arrived, circa 1903. Via Shorpy. Roads were seen as a public space, which all citizens had an equal right to, even children at play. “Common law tended to pin responsibility on the person operating the heavier or more dangerous vehicle,” says Norton, “so there was a bias in favor of the pedestrian.” Since people on foot ruled the road, collisions weren’t a major issue: Streetcars and horse-drawn carriages yielded right of way to pedestrians and slowed to a human pace. The fastest traffic went around 10 to 12 miles per hour, and few vehicles even had the capacity to reach higher speeds. 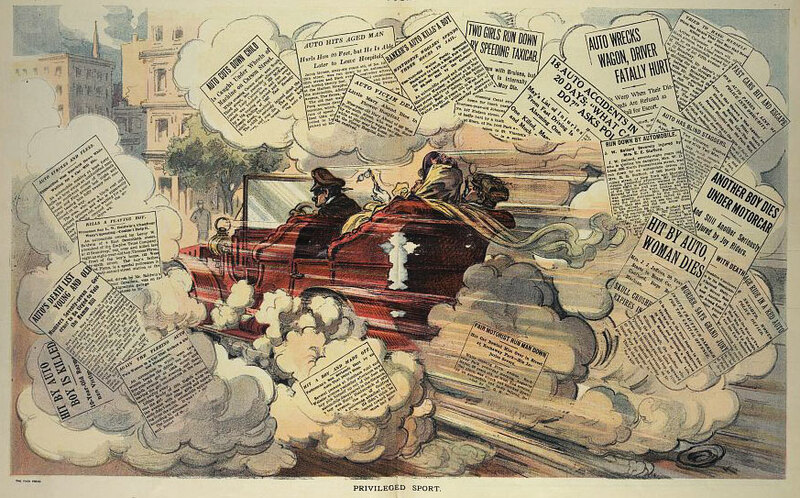 Eventually, the term spread to all types of automobile drivers, along with pejoratives like “vampire driver” or “death driver.” Political cartoons featured violent imagery of so-called “speed demons” murdering innocents as they plowed through city streets in their uncontrollable vehicles. Other editorials accused drivers of being afflicted with “motor madness” or “motor rabies,” which implied an addiction to speed at the expense of human life. 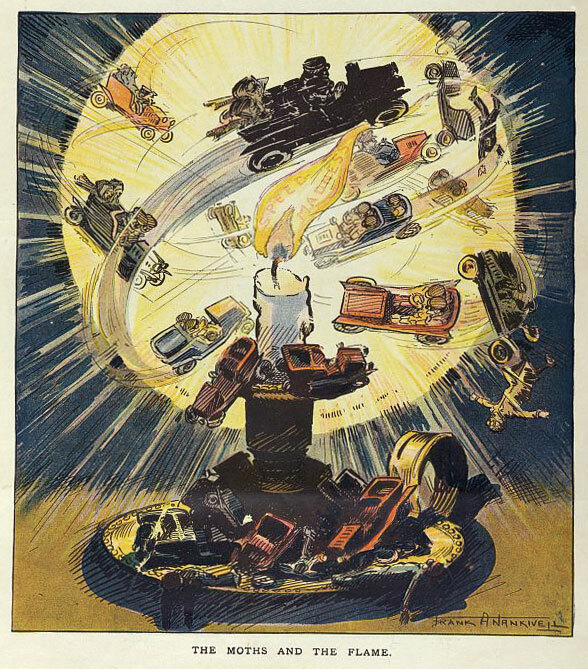 This cartoon from 1909 shows the outrage felt by many Americans that wealthy motorists could hurt others without consequence. Via the Library of Congress. In an effort to keep traffic flowing and solve legal disputes, New York City became the first municipality in America to adopt an official traffic code in 1903, when most roadways had no signage or traffic controls whatsoever. Speed limits were gradually adopted in urban areas across the country, typically with a maximum of 10 mph that dropped to 8 mph at intersections. By the 1910s, many cities were working to improve their most dangerous crossings. One of the first tactics was regulating left-turns, which was usually accomplished by installing a solid column or “silent policeman” at the center of busy intersections that forced vehicles to navigate around it. Cars had to pass this mid-point before turning left, preventing them from cutting corners and speeding recklessly into oncoming traffic. 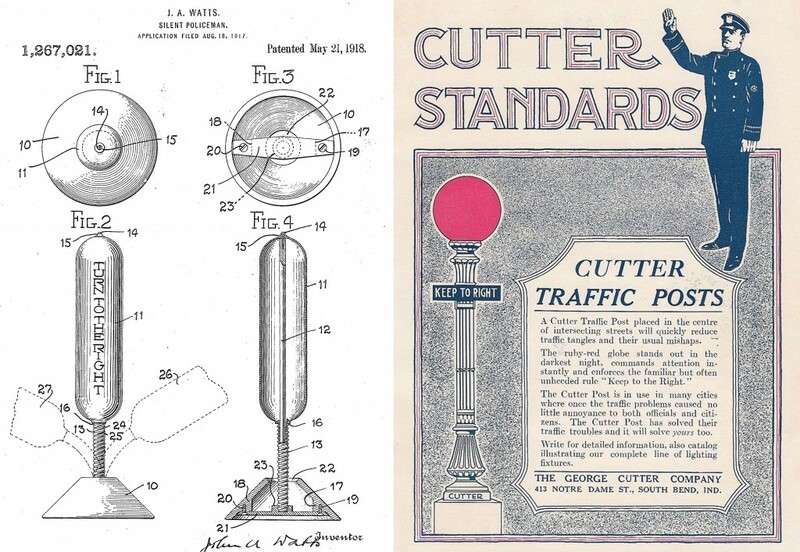 Left, a patent for a Silent Policeman traffic post, and right, an ad for the Cutter Company’s lighted post, both from 1918. A variety of innovative street signals and markings were developed by other cities hoping to tame the automobile. Because they were regularly plowed over by cars, silent policemen were often replaced by domed, street-level lights called “traffic turtles” or “traffic mushrooms,” a style popularized in Milwaukee, Wisconsin. Detroit reconfigured a tennis court line-marker as a street-striping device for dividing lanes. In 1914, Cleveland installed the first alternating traffic lights, which were manually operated by a police officer stationed at the intersection. Yet these innovations did little to protect pedestrians. Left, an ad for the Milwaukee-style traffic mushroom, and right, the device in action on Milwaukee streets, circa 1926. Via the Milwaukee Public Library. 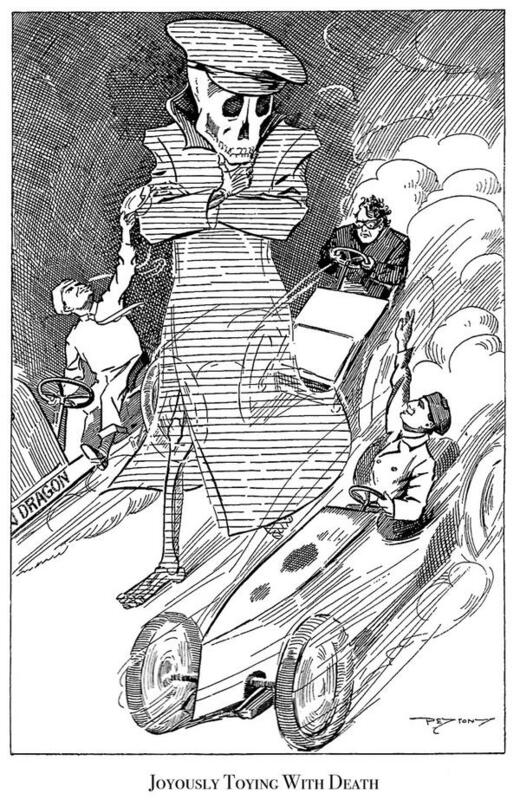 As early as 1905, newspapers were printing cartoons that criticized motor-vehicle drivers. 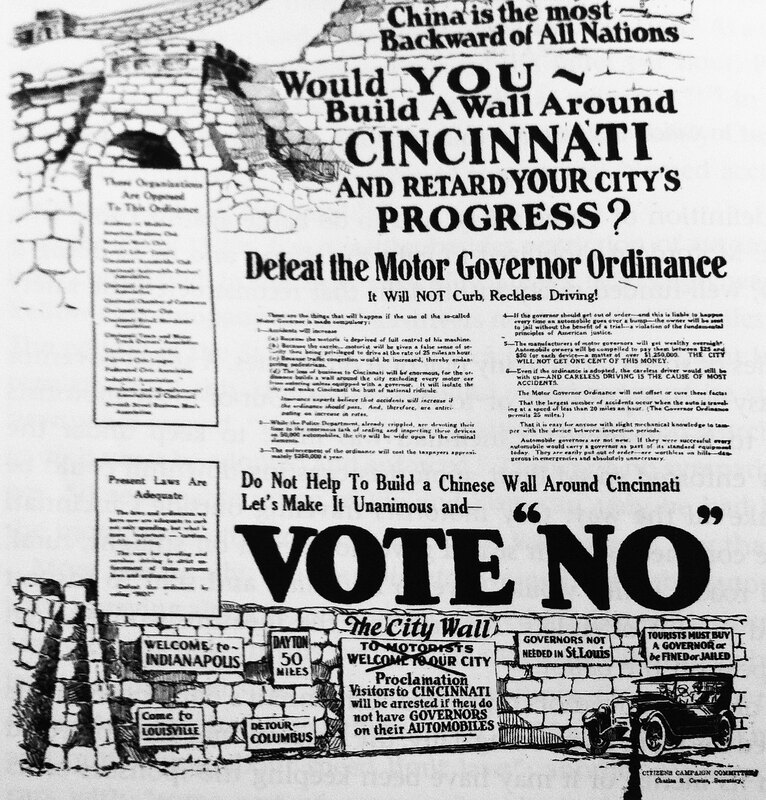 One auto-industry response to the Cincinnati referendum of 1923 was to conflate speed governors with negative stereotypes about China. Via the Cincinnati Post. “Motordom,” as the collective of special interests including oil companies, auto makers, auto dealers, and auto clubs dubbed itself, launched a multi-pronged campaign to make city streets more welcoming to drivers, though not necessarily safer. Through a series of social, legal, and physical transformations, these groups reframed arguments about vehicle safety by placing blame on reckless drivers and careless pedestrians, rather than the mere presence of cars. In 1924, recognizing the crisis on America’s streets, Herbert Hoover launched the National Conference on Street and Highway Safety from his position as Commerce Secretary (he would become President in 1929). Any organizations interested or invested in transportation planning were invited to discuss street safety and help establish standardized traffic regulations that could be implemented across the country. Since the conference’s biggest players all represented the auto industry, the group’s recommendations prioritized private motor vehicles over all other transit modes. 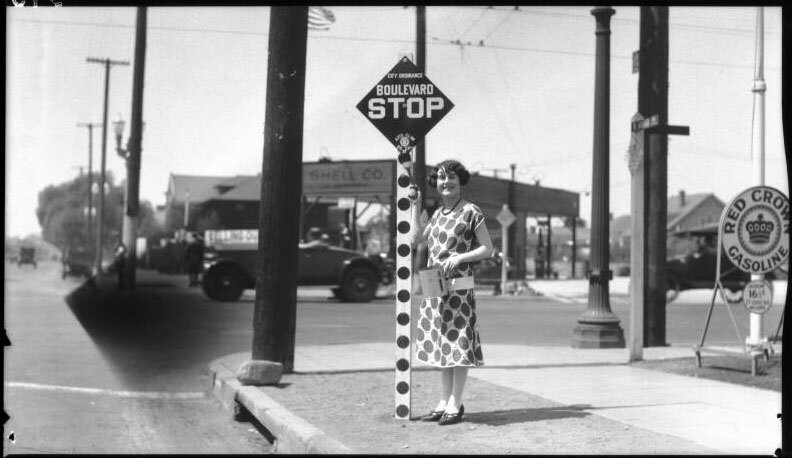 A woman poses with a newly installed stop sign in Los Angeles in 1925, built to the specifications recommended at the first National Conference on Street Safety. Via USC Libraries. Meanwhile, the auto industry continued to improve its public image by encouraging licensing to give drivers legitimacy, even though most early licenses required no testing. Norton explains that in addition to the revenue it generated, the driver’s license “would exonerate the average motorist in the public eye, so that driving itself wouldn’t be considered dangerous, and you could direct blame at the reckless minority.” Working with local police and civic groups like the Boy Scouts, auto clubs pushed to socialize new pedestrian behavior, often by shaming or ostracizing people who entered the street on foot. 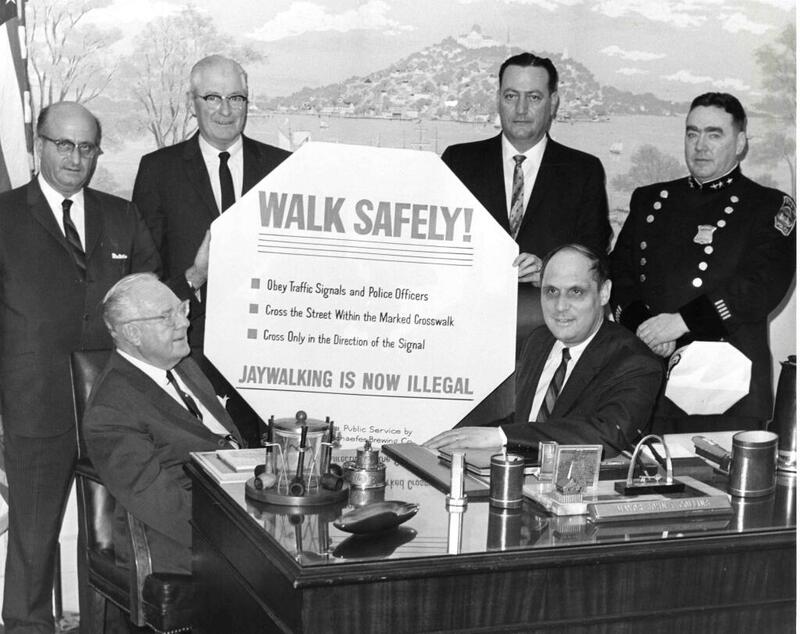 Part of this effort was the adoption of the term “jaywalker,” which originally referred to a clueless person unaccustomed to busy city life (“jay” was slang for a hayseed or country bumpkin). 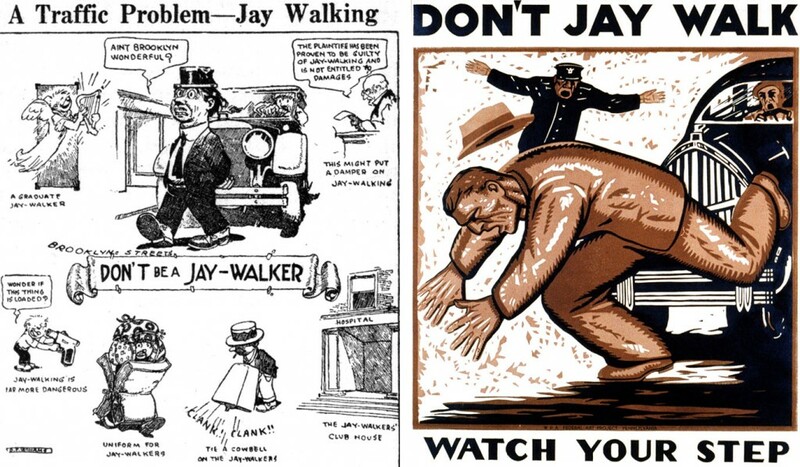 Left, a cartoon from 1923 mocks jaywalking behavior. Via the National Safety Council. Right, a 1937 WPA poster emphasizes jaywalking dangers. “Drivers first used the word ‘jaywalker’ to criticize pedestrians,” says Norton, “and eventually, it became an organized campaign by auto dealers and auto clubs to change attitudes about walking in the street wherever you wanted to. They had people dressed up like idiots with sandwich board signs that said ‘jaywalker’ or men wearing women’s dresses pretending to be jaywalkers. They even had a parade where a clown was hit by a Model T over and over again in front of the crowd. Of course, the message was that you’re stupid if you walk in the street.” Eventually, cities began adopting laws against jaywalking of their own accord. In 1928, the American Automobile Association (AAA) took charge of safety education for children by sending free curricula to every public school in America. “Children would illustrate posters with slogans like, ‘Why I should not play in the street’ or ‘Why the street is for cars’ and so on,” explains Norton. “They took over the school safety patrols at the same time. The original patrols would go out and stop traffic for other kids to cross the street. But when AAA took over, they had kids sign pledges that said, ‘I will not cross the street except at the intersection,’ and so on. So a whole generation of kids grew up being trained that the streets were for cars only.” Other organizations like the Automobile Safety Foundation and the National Safety Council also helped to educate the public on the dangers of cars, but mostly focused on changing pedestrian habits or extreme driver behaviors, like drunk driving. Street-safety posters produced by AAA in the late 1950s focused on changing behavior of children, rather than drivers. Once the social acceptance of private cars was ensured, automobile proponents could begin rebuilding the urban environment to accommodate cars better than other transit modes. In the 1920s, America’s extensive network of urban railways was heavily regulated, often with specific fare and route restrictions as well as requirements to serve less-profitable areas. As motor vehicles began invading streetcar routes, these companies pushed for equal oversight of private cars. 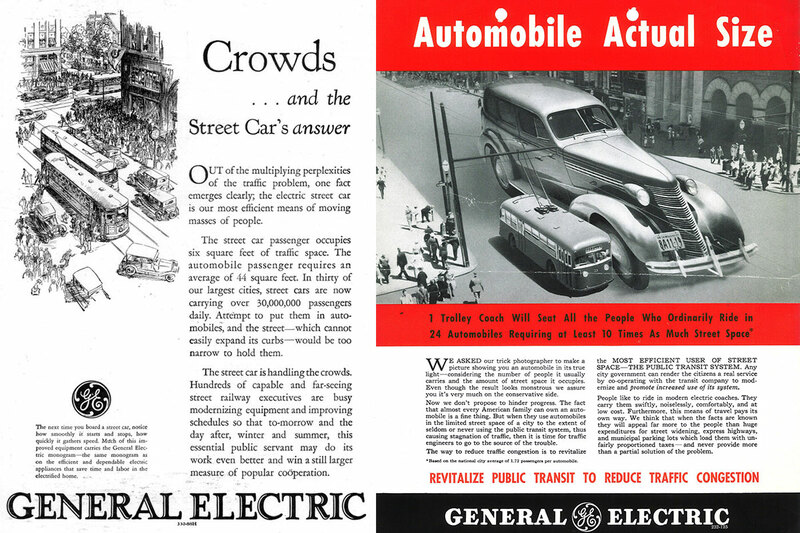 GE streetcar ads from 1928, left, and the early 1940s, right, emphasize the efficiency of mass transit over private automobiles. The final blow was delivered in 1935 with the Public Utility Holding Company Act, which forced electric-utility companies to divest their streetcar businesses. Though intended to reduce corruption and regulate these growing electric utilities, this law removed the subsidies supporting many streetcar companies, and as a result, more than 100 transit companies failed over the next decade. Even as government assistance was removed from these mass-transit systems, the growing network of city streets and highways was receiving ever more federal funding. Many struggling metro railways were purchased by a front company (operated by General Motors, Firestone Rubber, Standard Oil, and Phillips Petroleum), that ripped up their tracks to make way for fleets of buses, furthering America’s dependency on motor vehicles. Meanwhile, traffic engineers were reworking city streets to better accommodate motor vehicles, even as they recognized cars as the least equitable and least efficient form of transportation, since automobiles were only available to the wealthy and took up 10 times the space of a transit rider. Beginning in Chicago, traffic engineers coordinated street signals to keep motor vehicles moving smoothly, while making crossing times unfriendly to pedestrians. 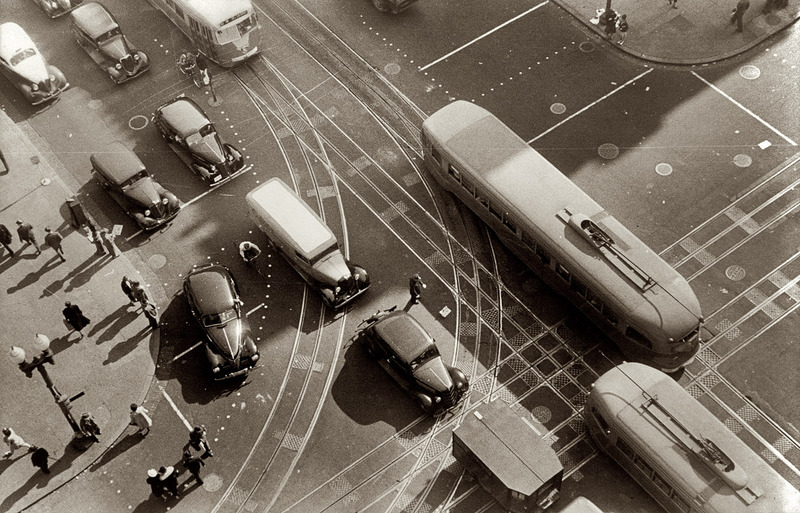 An aerial view from 1939 of 14th Street and Pennsylvania Avenue, in Washington, D.C., shows early street markings. Via shorpy.com. “Long after its victory, Motordom fought to keep control of traffic problems. Its highway engineers defined a good thoroughfare as a road with a high capacity for motor vehicles; they did not count the number of persons moved,” Norton writes in Fighting Traffic. Today our cities still reflect this: The Level of Service (LOS) measurement by which most planners use to gauge intersection efficiency is based only on motor-vehicle delays, rather than the impact to all modes of transit. All the while, traffic violence continued unabated, with fatalities increasing every year. The exception was during World War II, when fuel shortages and resource conservation led to less driving, hence a drop in the motor-vehicle death rates, which spiked again following the war’s conclusion. By the time the National Interstate and Defense Highways Act was passed in 1956, the U.S. was fully dependent on personal automobiles, favoring the flexibility of cars over the ability of mass transit to carry more people with less energy in a safer manner. In 1962, Boston formally adopted jaywalking laws to penalize pedestrians. In 1966, Ralph Nader published his best-selling book, Unsafe At Any Speed, which detailed the auto industry’s efforts to suppress safety improvements in favor of profits. In the preface to his book, Nader pointed out the huge costs inflicted by private vehicle collisions, noting that “…these are not the kind of costs which fall on the builders of motor vehicles (excepting a few successful lawsuits for negligent construction of the vehicle) and thus do not pinch the proper foot. Instead, the costs fall to users of vehicles, who are in no position to dictate safer automobile designs.” Instead of directing money at prevention, like vehicle improvements, changing behaviors, and road design, money is spent on treating the symptoms of road violence. Today, the costs of fatal crashes are estimated at over $99 billion in the U.S., or around $500 for every licensed driver, according to the Center for Disease Control (CDC). Nader suggested that the protection of our “body rights,” or physical safety, needed the same broad support given to civil rights, even in the face of an industry with so much financial power. “A great problem of contemporary life is how to control the power of economic interests which ignore the harmful effects of their applied science and technology. The automobile tragedy is one of the most serious of these man-made assaults on the human body,” Nader wrote. Ralph Nader’s book, “Unsafe at Any Speed,” brought a larger awareness to America’s traffic fatalities, and targeted design issues with the Corvair. A few years prior, in 1962, comedian Ernie Kovacs was killed in a Corvair wagon, seen at right wrapped around a telephone pole. The same year Nader’s book was published, President Lyndon Johnson signed the National Traffic and Motor Vehicle Safety Act and the Highway Safety Act. This legislation led to the creation of the National Highway Traffic Safety Administration (NHTSA), which set new safety standards for cars and highways. A full 50 years after automobiles had overtaken city streets, federal agencies finally began addressing the violence as a large-scale, public-health issue. In 1969, NHTSA director Dr. William Haddon, a public-health physician and epidemiologist, recognized that like infectious diseases, motor-vehicle deaths were the result of interactions between a host (person), an agent (motor vehicle), and their environment (roadways). As directed by Haddon, the NHTSA enforced changes to features like seat belts, brakes, and windshields that helped improve the country’s fatality rate. Following the release of Nader’s book, grassroots organizations like Mothers Against Drunk Driving (MADD, 1980) formed to combat car-safety issues that national legislators were not addressing. The CDC began adapting its public-health framework to the issue of motor-vehicle injury prevention in 1985, focusing on high-risk populations like alcohol-impaired drivers, motorcyclists, and teenagers. 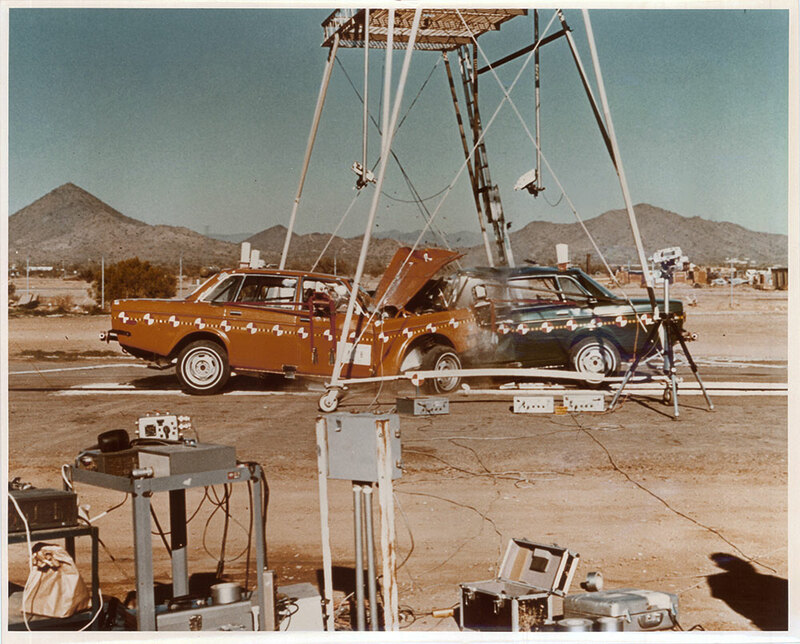 In the late 1970s, the NHTSA standardized crash tests, like this 90 mph test of two Volvos. Sleet says the CDC’s approach is similar to its efforts against smoking: The first step is understanding the magnitude of the problem or threat, the second is identifying risk factors, and the third is developing interventions that can reduce these factors. “The last stage is getting widespread adoption of these known and effective interventions,” explains Sleet. “The reason we think motor-vehicle injuries represent a winnable battle is that there are lots of effective interventions that are just not used by the general public. We’ve been fighting this battle of increasing injuries since cars were first introduced into society, and we still haven’t solved it. 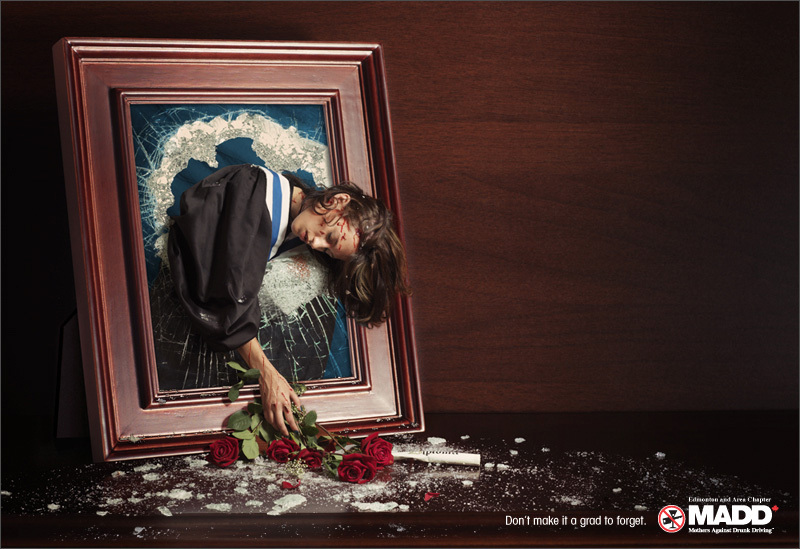 Though their advocacy is limited to drunk driving, MADD is one of the few organizations to use violent imagery to promote road safety, as seen in this ad from 2007. Although organizations like the CDC have applied this public-health approach to the issue for decades now, automobiles remain a huge danger. While the annual fatality rate has dropped significantly from its 1930s high at around 30 deaths for every 100,000 persons to 11 per 100,000 in recent years, car crashes are still a top killer of all Americans. For young people, motor-vehicle collisions remain the most common cause of death. In contrast, traffic fatalities in countries like the United Kingdom, where drivers are presumed to be liable in car crashes, are about a third of U.S. rates. In 2012, automobile collisions killed more than 34,000 Americans, but unlike our response to foreign wars, the AIDS crisis, or terrorist attacks—all of which inflict fewer fatalities than cars—there’s no widespread public protest or giant memorial to the dead. We fret about drugs and gun safety, but don’t teach children to treat cars as the loaded weapons they are. 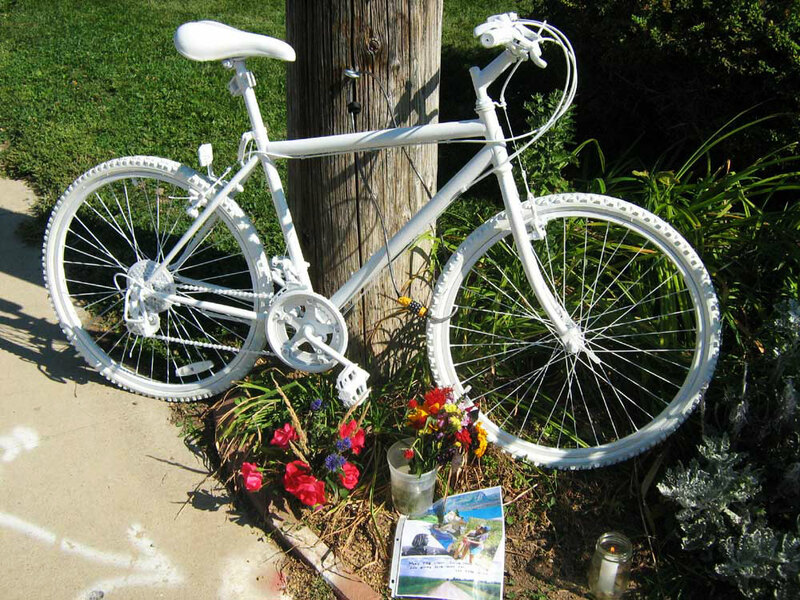 In recent years, white Ghost Bikes have been installed on roadways across the country where cyclists were killed by motorists, like this bike in Boulder, Colorado, in memory of Matthew Powell. 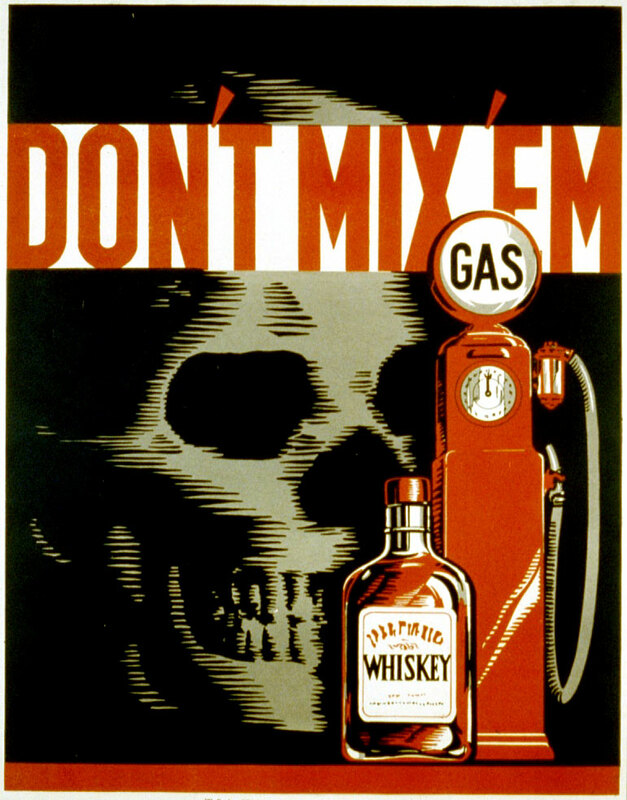 Though drunk driving has long been recognized as dangerous, seen in this WPA poster from 1937, reckless driving has been absent from most safety campaigns. Increasingly, victims and their loved ones are making the case that careless driving is as reprehensible as drunk driving, advocating a cultural shift that many drivers are reluctant to embrace. As with auto-safety campaigns in the past, this grassroots effort is pushing cities to adopt legislation that protects against reckless drivers, including laws inspired by Sweden’s Vision Zero campaign. First implemented in 1997, Vision Zero is an effort to end all pedestrian fatalities and serious injuries; recently, cities like New York, Chicago, and San Francisco also announced their goals of eliminating traffic deaths within 10 years. Other initiatives are being introduced at the state level, including “vulnerable user laws,” which pin greater responsibility on road users who wield the most power—whether a car compared to a bicyclist, or a biker to a pedestrian. This dark political cartoon from “Puck” magazine in 1907 suggested that speeding motorists were chasing death. Via the Library of Congress. However, studies increasingly show that most young people prefer to live in dense, walkable neighborhoods, and are more attuned to the environmental consequences of their transportation than previous generations. Yet in the face of clear evidence that private automobiles are damaging to our health and our environment, most older Americans still cling to their cars. Part of this impulse may be a natural resistance to change, but it’s also reinforced when aging drivers have few viable transportation alternatives, particularly in suburban areas or sprawling cities with terrible public transit. 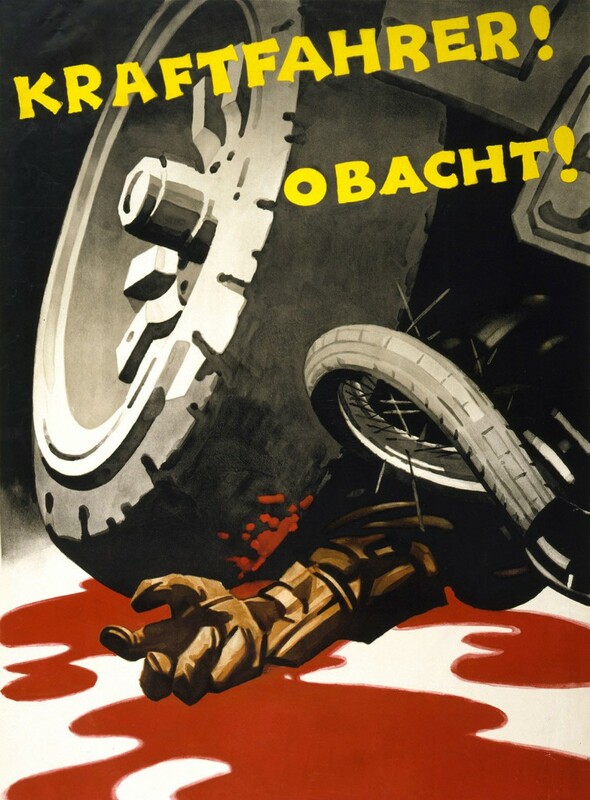 Gory depictions of car violence became rare in the United States after the 1920s, though they persisted in Europe, as seen in his German safety poster from 1930 that reads, “Motorist! Be Careful!” Via the Library of Congress. This 1935 Chevy safety film made the argument that motor vehicles were “the safest place to be,” and that danger was only created by careless drivers. What a brilliant and informative article. Bravo! I live in a Canadian city of 1.2 million that averages 1.5 pedestrians hit by vehicles per DAY. Frightening, especially for a dedicated walker such as myself (voluntarily gave up the car over five years ago, haven’t regretted it once). Recently, a woman was hit and killed in the downtown core, early in the afternoon on a clear day, not two blocks from her office, in a marked crosswalk on a green light. She did everything she was supposed to, but was still struck fatally by a turning vehicle. The driver was finally charged last week: “failure to yield to a pedestrian”, a $545 fine, plus 4 demerit points (only 1/4 the amount required for a 1-month licence suspension), and exactly the same charge that would have been issued had the driver missed the pedestrian entirely. The message to me as a pedestrian: you’re on your own, the justice system is not looking out for you, and pedestrian casualties are an acceptable and unavoidable side-effect of urban life. Something desperately needs to change. An impressive article; I certainly agree as with any machine, the operator determines the ultimate safe usage, both for the operator and those with whom the machine comes in contact other than the operator. Big money brings big lobby which affects the world of law in an unbalanced scenario. My belief is someone who operates anything from a power saw to a rifle to an automobile to a nuclear power plant and including a bicycle must behave in line and in responsibility with the possible/probable damage the machine can inflict upon both the operator and others. Including direct and indirect damage. Excellent article raising consideration of an issue which affects most people in one way or another. A couple of years ago, I was surprised to find out what many have already mentioned, that car drivers who hit pedestrians in crosswalks rarely if ever get so much as a fine or a demerit point against their license. But after paying attention to what happens when car drivers are irresponsible, I was hardly surprised when I got a demerit point after being an eyewitness to a very distracted car driver who made an illegal left turn and hit a motorcyclist. Yes, I was on a motorcycle too at the time. No, I was not in any manner involved in the collision (I refuse to call it “accident”; when drivers bumble around at random in cars with most the windows blacked out, without even looking out the front window, and not considering the possibility of others on the road, collisions are expected). But according to the CHP, I was more at fault than the car driver, who got off scot free though he failed to get a payout on his claim against my insurance. With law enforcement so corrupt, there is no incentive to driving safely. Actually, there is an incentive to just the opposite; when law enforcement automatically blame motorcyclists for any accident they are involved in or in the immediate vicinity of, car drivers who have dented their cars against poles, fences, or other cars have an incentive to hitting motorcycles, as they can then make a claim against the motorcyclist’s insurance! Heartland homicide is generally committed by inexperienced youth or impaired or impatient or drugged drivers pulling into traffic without yielding, lots of two-wheelers killed like this. Then, there’s the big trucks driven by economically enslaved maniacs for maniacs who worship profit. I would favor a thirty-five mile an hour limit nationwide, with long distance covered by train car carriers. Residential areas let’s say 15 max. We’re all living longer, what’s the durn hurry? Wouldn’t be bad for air quality either. Autos are safer BECAUSE of people like Nader and therefore, and despite the numbers, fewer folks are crippled, maimed or killed than would be otherwise. This car lover is also a road cyclist. There are plenty out there who give all riders at all levels a dubious reputation. That said, it is unbelievable how many drivers can’t safely pass a cyclist with endangering anyone involved. Many of these same people gripe about how cyclists flan the law while they text behind the wheel, run lights and can’t seem to find their turn signal lever. Separate cyclists from the road? Not bloody likely. There will be more and more people rideing the streets as the years go by and I’m not talking about the Spandex set. Get used to it and make the necessary adjustments. Those whatevers will still be on sale if you have to slow down for a few seconds. Definitely a great article. I myself do not advocate for bike lanes, because they actually make traffic MORE confusing, not less. Cyclists should ride in the lane with cars; it reduces danger because motorists SEE you, and therefore won’t hit you. I’m sick and tired of “travelling to work in Anchorage, Alaska justifies the existence of the automobile in the entire country”. There are more cities in the United States than just Anchorage. The city with the most problems is Los Angeles. How often do they have 0 degree temperatures? Extreme climate in a limited number of locations is traditionally used to justify a behaviour which people refuse to change. What speed will driverless cars do? The speedlimit and no more! Eliminating the right-turn-on-red will only make the car vrs pedestrian problem worse – when are you going to turn right then? When the light is green, that’s when pedestrians are crossing the street you’re trying to turn on to. A good point about dangerous cyclists being dangerous drivers – probably the case. However most cyclists are also drivers (at least in Oregon) so kind of a moot point. We live in an increasingly unequal world – it costs literally twice as much to live in Portland as it costs to live basically anywhere else in the state. Plus maybe I’d like to live somewhere where I can secure the safety of my family while they sleep, it’s a lot harder to do that in an apartment. As for change, how about you change and stop trying to force what you think people need, on everyone. That food you like is grown on a farm, farms need vehicles – lots of them. A simple google search for “cyclist” and “manslaughter” will get you TONS of drivers charged with manslaughter for hitting cyclists. It is usually up to the DA to make that choice, and I think that’s probably best. I have friends who have died from getting hit by cars, and I have friends who have killed cyclists with their cars. You don’t get off “scott free” for killing someone with your car. Most of the time you never drive again – and those that do think about the person they hit every time their hands hit the steering wheel for the rest of their lives. This article and 90% of the responses are still more of the same – Blame someone else, it’s not my fault! The road isn’t the battlefield, your whole life is – duck and cover. The article should really cover the additional few millions who die from diseases secondary to inactivity – since cars are simply couches with wheels where people drive from their doorstep to the doorstep of their jobs. Research has shown drivers burn fewer calories than any other class of commuter (i.e rail, tram, bicycle, walk), and the correlation between type 2 diabetes prevalence over the past 50 years and car ownership is near perfect. That’s not a tenable solution, given the amount of mileage you would have to duplicate in order to make separate bike paths that would get cyclists to all the places that roads already go. The fact of the matter is that bikes and cars (and pedestrians) will mix, must mix- at intersections, crosswalks, driveways, etc.- it’s unavoidable. We all have to follow the rules to make our presence predictable and as safe as possible to other travelers, but given the increased risk that cars pose to cyclists and pedestrians, it is the car drivers who must bear the burden of responsibility for the safety of the more vulnerable. We have to start teaching are requiring car drivers to look for, and be accountable for the safety of cyclists and pedestrians. Cyclists should be riding in the lane, where they’re most visible to all cars, just like a motorcycle. And car drivers should be looking for them, and expect them to be there. The excuse of, “I didn’t think anyone was there [because I was only looking for other large vehicles like myself].” just isn’t good enough. When I was learning to drive about 20 years ago, the drivers’ manuals for Mississippi and Alabama both explicitly stated that, in all situations, pedestrians and bicyclists have the right-of-way. Is this something that’s been removed from the manuals since the mid-90s? If so, why? Here we go again, motorist haters versus their vulnerable victims. Been discussing transportation as a basic life modality for decades in my blog and book, Bike&Chain. Self propulsion via bike or feet or wheel chair is an unalienable right, like breathing. It’s already banned most places, particularly limited access highways, but legally takes precedence on surface roads. Federal and state laws mandate “complete streets” in which non-motorists get preference with nearby alternatives where impractical. An operator’s license is a contract not to kill and maim. The straight line to improving this tragic mess is to deny, revoke and suspend them, but this won’t happen in a society so dependent upon automotive spending. So reminiscent of Fitzgerald’s The Great Gatsby. Spoiler alert: Daisy runs down a pedestrian and Gatsby covers for her with his life. Clearly, there will always be a need for automobiles. Too many municipalities do not have useful transit or pedestrian/ bicycle facilities, were designed assuming everyone will always have a car (e.g., subdivisions with curvy raked-zen-garden street patterns and precisely one entrance from the closest major road, commercial zoning that requires acres of parking for retail development, et cetera), or are just little tiny towns in rural areas too far to walk or bike to the nearest burg with needed goods/ services. Too many people have health or mobility issues and simply can not walk or bike. Understood. Having said that, however, the car is just ONE mode of transport, not THE mode of transport. Putting cars first to the exclusion of all other modes has not created healthier cities or people; in fact the opposite has occurred. It is time to pull the plug on the “car is king” experiment and shift the focus from how to move X cars from point A to point B, and toward creating more options for allowing more PEOPLE to make the same trip. 2016 will most likely have 34.000 kills as the current trend is going up after early 2000 was decreasing. USA global rank is 6th on car kills because this country is a car country. No sufficient public transport solutions available. Cars are nothing but awful cancer causing poverty keeping conformity boxes. The millennial generation is sacrificing the special feeling of having a car for the pleasure of being on their gadgets by train, bus or cab. More production in the end. A traffic jam represents a large amount of lost production where as being on a Bus, train, or Cab or just walking will lead to much more production and an increase in the human spirit. DOWN WITH CARS!!!!!! God bless a future w/o Cars. They kill so many is because they are legal just like tobacco and alcohol. Hey i blame auto mobiles partially for obesity too. I have for years. Lawrence Selkirk: I contend quite strongly that if you make the rules of the road work for cyclists, they will follow them. You probably won’t want to hear it, but don’t shut off your brain to what I am about to say: the rules as they are set up today are impractical and sometimes dangerous to cyclists. If I stop at a red light and wait for it to change, I may well be run over by the cars behind me when it changes; if I run the light when there is a safe gap (which I can judge much more easily on a bike than in a car because if have practically no limitations on my visibility), I will NOT be run over by those cars becuase they don’t run that light; the same ifs true of stop signs. Even when no other traffic is waiting, sometimes, by running them, you increase your safety by eliminating the hazard of the traffic which may roll up behind you as you wait for a gap. Even if you know no traffic is there, you will often increase your safety by decreasing fatigue and stress incurred at the junctions. Driving is an inherently dangerous mode of transportation that ought to be treated and thought of as such. Until the car existed, people really did have the right to walk anywhere they wished, and there is no reason that they shouldn’t today (except that blasted automobile causing danger everywhere). I would say that in order to ensure this, it should be motorists who do not get to drive everywhere. That’s my thinking. By the way, I do drive. I am still learning, but man, I think it would be much safer if people did not have to drive at all. Bikes are not moter vehicules and as long as bikes are on the road with moter vehicles, there will be bicyclist’s injured and killed. “ ” It was at this barbershop that he gained a glimmer of awareness of the larger black freedom struggle.